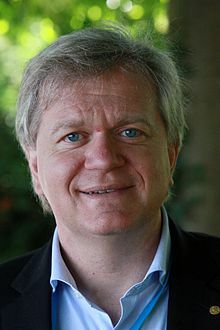 Brian Paul Schmidt (born 24 February 1967) is the Vice-Chancellor of the Australian National University (ANU). He was previously a Distinguished Professor, Australian Research Council Laureate Fellow and astrophysicist at the University's Mount Stromlo Observatory and Research School of Astronomy and Astrophysics. He is known for his research in using supernovae as cosmological probes. He currently holds an Australia Research Council Federation Fellowship and was elected a Fellow of the Royal Society (FRS) in 2012. I have been described by one of my colleagues as a 'militant agnostic' with my tagline, 'I don't know, and neither do you!' I take this hard-line, fence-sitting position because it is the only position consistent with both my scientific ethos and my conscience. I don't even really know what the big bang is, and so when people want to go through and say, 'Well, I believe that the universe started by God starting it,' that's fine by me. I think a scientist's job is to explore the Universe, to explore the cosmos around us. People always want to know - why is that useful? Well, on just pure fundamental grounds, on some level it's like art, it's like umm, music, it's aesthetics, it's like philosophy. You want to know where you are in the Universe. The reality is that I'm making better wine than I thought I would. The whole process is simple but beautiful.